Riverbanks play a critical role in water quality and sedimentation in waterways. The riverine zone is critical wildlife habitat if vegetated and it provides a vital corridor between otherwise isolated pockets of biodiversity. Un-vegetated riverbanks collapse during high flows. Waterways become wider and shallower. ‘Hard’ engineering strategies are stone masonry, gabions, riprap and concrete armoring. These strategies retain riverbanks although they do not mitigate against sedimentation or provide habitat for wildlife. ‘Soft’ engineering, or bioengineering, uses appropriate vegetation to retain riverbanks, it is less expensive and provides multiple benefits. Appropriately vegetated riverbanks intercept sediment in overland flows dramatically improving water quality in waterways. when riverbanks collapse. Sedimentation of waterways impacts on water quality and exacerbates flooding. Re-vegetation of riverbanks is therefore one of the most valuable strategies to be employed in sustainable land management. Only plants with deep root systems can effectively anchor riverbanks during high flows. Trees with deep taproots provide deep, but isolated anchors. Effective protection requires coverage by plants with deep but fibrous root systems. This dramatically reduces the available choices of suitable plants. The diagram above shows different management strategies for stable riverbanks. natives form a canopy the vetiver will slowly die out as shading increases. Over time, vetiver will remain only in those areas not shaded out by other plants. 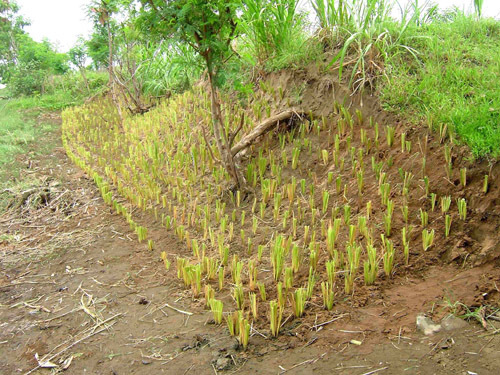 If simply stabilizing the banks while retaining maximum space for agriculture or infrastructure is the aim, vetiver grass is the most space-effective solution. In engineering terms, it is permanent and durable. Vetiver has the added advantage of acting as a filter of overland flows, reducing soil erosion and subsequent sedimentation of waterways. Even in the absence of native species, vetiver is a more natural and more aesthetic solution than hard engineering. Vetiver is less resource intensive, not requiring large quantities of rock or cement and the transport costs they incur. Establishing vetiver is labor-intensive providing significant work for locals, especially in rural areas. 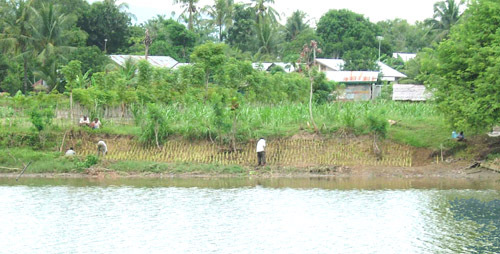 Riverbank stabilization projects using vetiver are more likely to benefit local communities rather than large contractors. disciplined approach used in conventional engineering. Spacing and other design elements must be strictly controlled and adhered to in implementation. A practical establishment regime must also be planned, funded and executed. Once vetiver plants are established no further maintenance is usually required.